I want to thank everyone for their feedback on the new look of the newsletter, as well as on my video posts. Feedback on this new format for the newsletter has been overwhelmingly positive, so I’ll continue to move forward with it. There might be a slight tweak here and there, but overall this more streamlined approach is here to stay for a while. The majority of people don’t actually watch my videos. I’ll do fewer “talking head” videos – probably dialing it back to once a month or so. I, too, like the sense of contact actually seeing a real person can provide, so I don’t want to abandon it completely. I also want to stay in practice. I’m working on a project that will deliver more screen-capture how-to videos for patrons. I hope to have news on that next week. One thing I heard loud and clear was the importance of transcripts for all videos. While most might not watch the videos, the vast majority read the transcripts. This is actually something I’ve realized for a long time, and all my videos for something like the last year – perhaps longer – have always included a transcript within a couple of days of the video’s publication. Not only do many people prefer to read, it’s searchable (whereas video is not, today), and can help make what is said much clearer, especially to those who don’t speak English natively. This will not change. When I post a video, it’ll have a transcript (within a day or two – it does take time). I’m actually surprised more video publishers don’t do this. A couple of comments made me wonder if folks are missing the audio player at the end of all new articles. 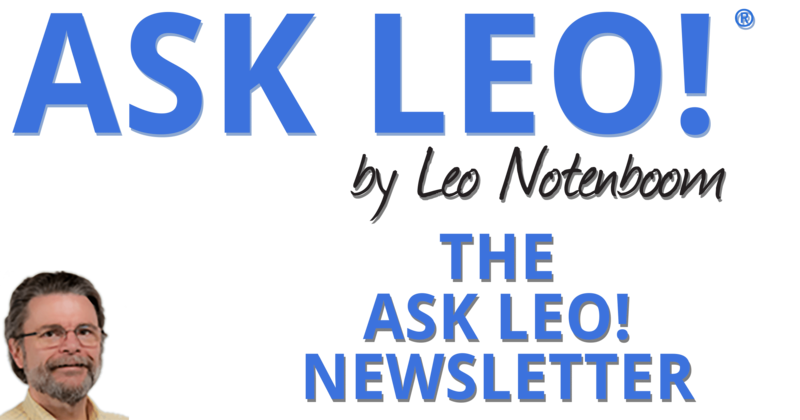 In fact, that’s what The Ask Leo! Podcast is all about. For those who’ve expressed an interest in listening, I hope this helps. Thanks, again, for all your input. I truly appreciate it. Related Links & Comments: Why Do Ads Follow Me Around the Internet? My, oh, my, but hasn’t 2016 been a year full of controversy and change? As we start the new year, it’s good to review exactly what grabbed people’s attention in 2016. Continue Reading: How Should I Back Up an Encrypted Hard Disk? Tip of the Day: Address Bar or Search?